Our little house we lovingly call the cabana was flooded well above the roof with mud in 2009. In early 2012, we tore down the ceiling and found 8 sacks of fine soil / old mud. Then again this 2012 waist high flood, new stink. We’ve gotten sick with indoor pollution many times since 2009. After the 2012 flood the family had totally abandoned sleeping in the cabana. We tried many things to disinfect and dry the place: vinegar, charcoal, herbal sprays, chemical sprays, smoking, then we boarded up the gap with the roof last month. The most effective last method I tried was continuously running a desktop electric fan 24 hours a day on anywhere and everywhere it stank. That fan motor burned down after almost 2 weeks non stop, but I had it fixed. Well worth it. 2 weeks ago I noticed that water seemed to be seeping out of the toilet out into the walls outside the toilet. I asked for white cement to seal the rotten toilet posts. But the leaking still happened. Maybe more white cement at the base? As my guy was going to put on the white cement, he smelled that the stink seems to be coming indeed from the walls where the tiles were stuck on. We traced the water and yes, the water was coming from the walls. 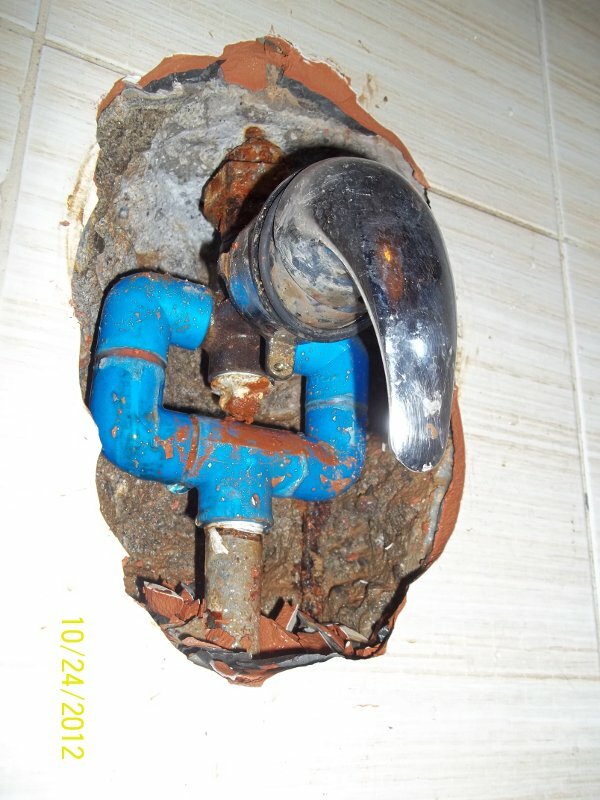 Seems there was a leak in the plumbing headed towards the shower. We called up our trusty plumber Mang Ben Balthazar, you know, that now 60+ year old guy I taught how to cure himself of “6 months to live” terminal liver cancer in end of 2008? He’s bull strong now, meatier and plumbing away. Mang Ben had to chip away at the shower valve tiles and cement to find that the old pipes and mechanism needed to be replaced. 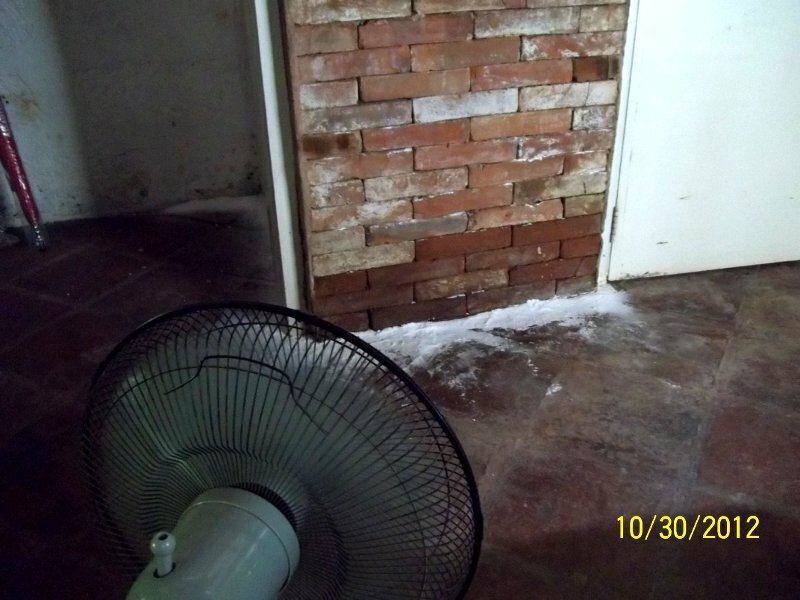 They were THE ROOT CAUSE of our mold / fungus stink as they had been continuously drenching the walls from the inside, and while those walls are wet, mold and fungus were continuously being fed. So we got to replace the pipes and the shower valve. 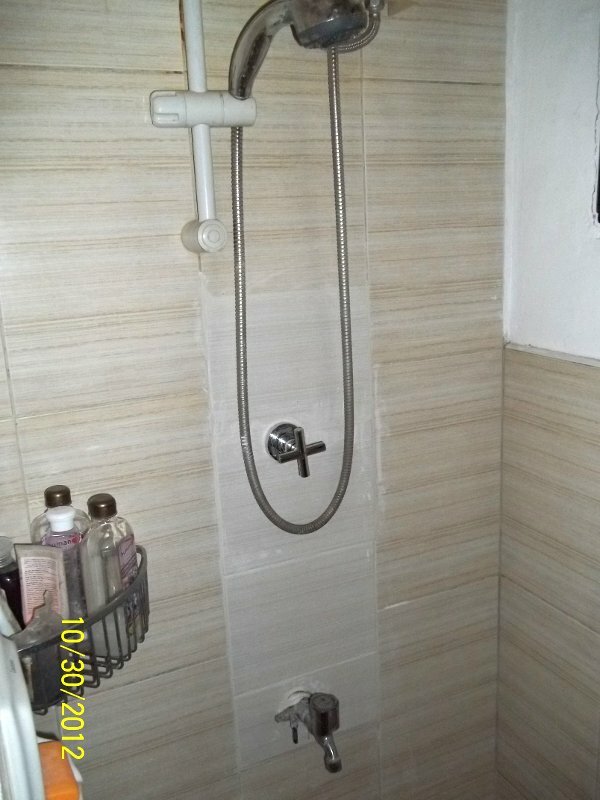 We got the cement guy and tile guy, Mang Ben’s son to replace the shower tiles. Outside the walls of the shower to help dry the floor I dumped 1 kilo of baking soda to help absorb any moisture. My smell test says things are better. My wife says not yet. My 2 sons and I already slept in the next more open aired half of the cabana for the past 2 days. Our lungs are fine. We will be floor polishing next. We also have this idea of painting the porous walls with a non porous type of paint so dust does not stick.